I showed up at the airfield for the day’s first jump at 0800. Paratroopers were prepping their oxygen masks. They were jumping 19,500 feet today, so we’d have to pre-breath O2 on the bird and under canopy. I was anxious to get feedback from the jumpers. They were about to try out the prototype jump board we had conceived together a mere 48 hours earlier. How’s that possible, you ask? Let me start at the beginning. 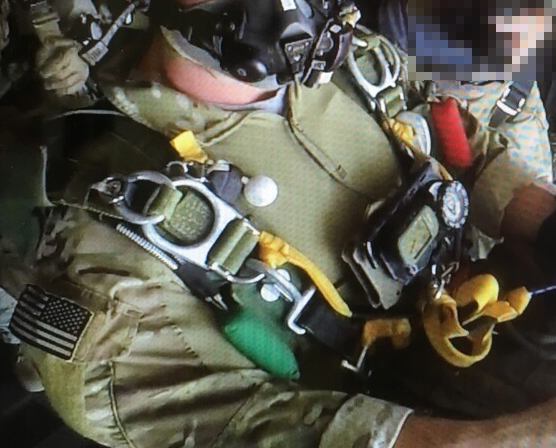 MFF jump board providing navigation tools for patatroopers. 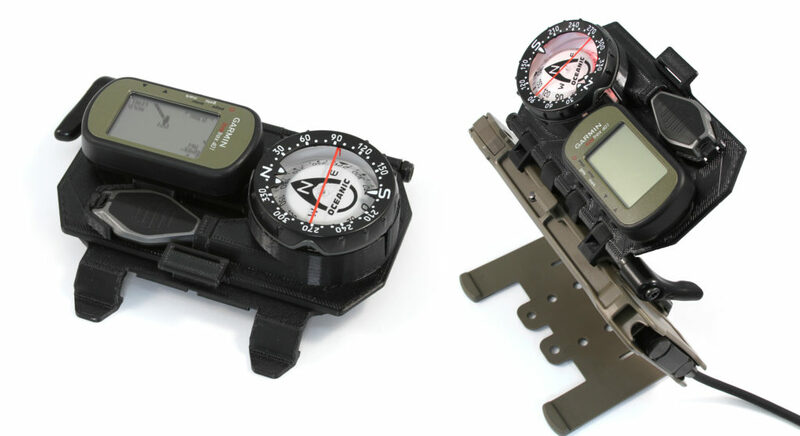 Designed to be deployed after the canopy is deployed, the compass and GPS are redundent to the android app. 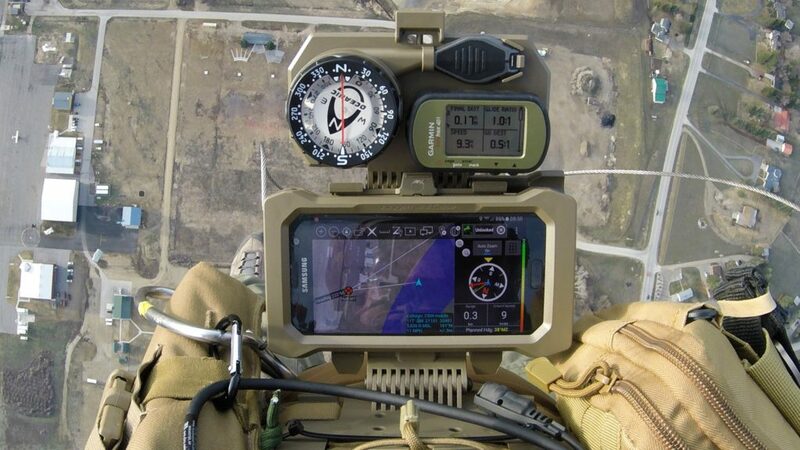 A while back we were tasked with applying our product design skills to developing a new military freefall (MFF) navigation tool that incorporated the Juggernaut.Case (tactical case with a commercially available cell phone) and Armor.Mount already in use by special forces. The jump board provides a type of dashboard for the paratrooper with an app that displays navigation much like an automobiles GPS. The project needed to accommodate heaters, a mounting solution, stylus garage, screen protectors, etc… all requirements that came as part of the Combating Terrorism Technical Support Office (CTTSO) program. Yes, the government has an acronym for everything. With the success of this program, we got called back as users wanted a simplified version with just the essentials as paratroopers are already over-burdened with equipment on their missions. It was this request that found me at the Yuma Proving Ground Advanced Tactical Insertion Course to meet the MFF Instructors. Here, students had built their own Nav-Boards with limited materials and tools. What we observed were simple designs that incorporated just the essential tools for MFF Navigation for high altitude, high opening jumps. CAD solid models of jump board components. 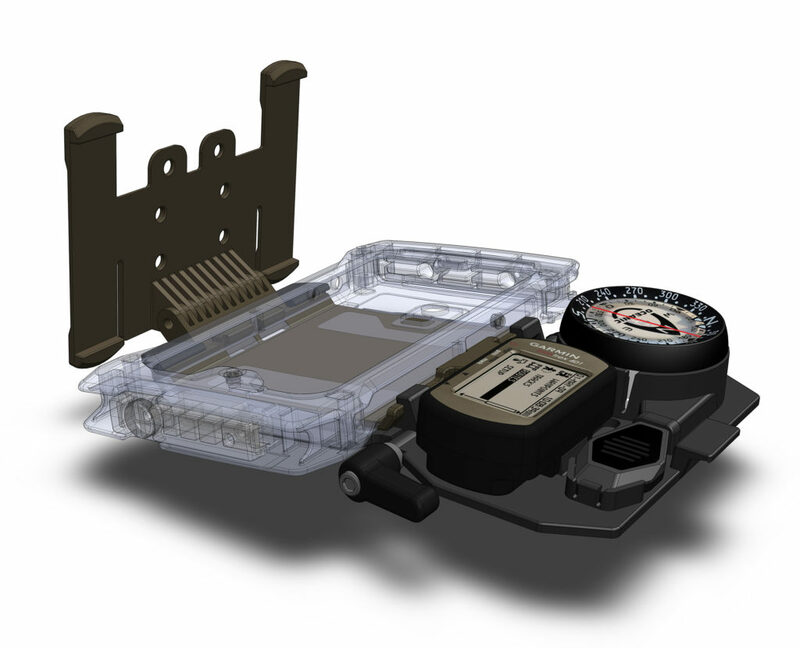 The phone case and mount are existing products and the black area is the jump board attachment concept for holding the compass, compass light and GPS. The system needs to be stowed flat and secure until the canopy is opened. Armed with this input, I went to work immediately. Using a tablet sketch pad on-site, I drew up designs that addressed their requirements. After several rounds of sketches between jumps, the group of roughly 25 students and instructors gave the “green-light” to a design iteration. Back at my hotel room, we had a laptop setup to complete the 3D modeling. Direct user observation from earlier in the day was critical to generating quality solutions at this point in the process. The next morning, students and instructors assembled once again where I displayed the digital models on a projector. After a couple of real-time tweaks to the product design based upon further feedback, the group left for the day’s first jump. I, on the other hand, connected to my 4G/LTE hotspot and pushed the 3D CAD files back to the engineers at our studio. Our team showed their agility, quickly making a few modifications to the hinge design and the exit retention clip optimizing strength based on finite element analysis (FEA), then sent the files back. Upon approval, the files were exported to one of our 3D printers. Eleven hours later, parts were being assembled and overnighted back to me at the Yuma Proving Ground drop zone. 3D printed FDM prototypes ready for testing. The FDM prototypes were printed in ABS plastic which closely represents the properties of injection molded parts. On the open ramp and ready to jump with display stowed. The system needs to be easily operated with gloves. The next morning, 48 hours later, we had a prototype that was ready for an instructor to test on the days first jump at 0800! 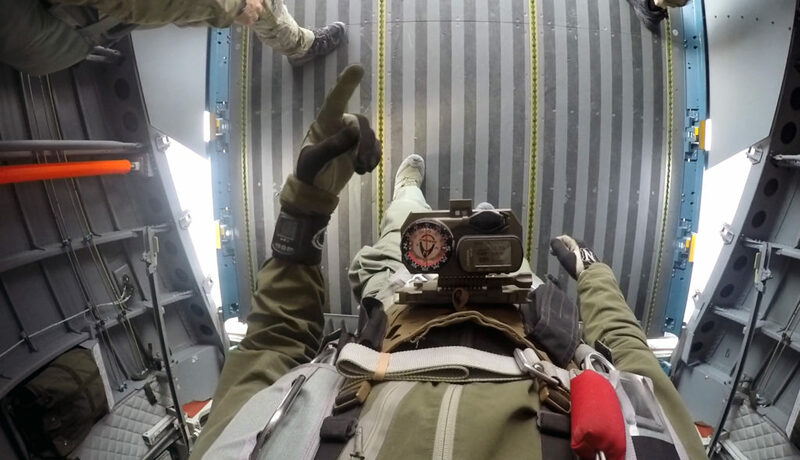 It was thrilling to observe this jump from the aircraft as the instructor made his way to the ramp with all of the prototype kit assembled to his plate-carrier and launched himself into the big blue. I was able to observe GoPro footage of all the days jumps during the debrief which provided invaluable information for final product design modifications. 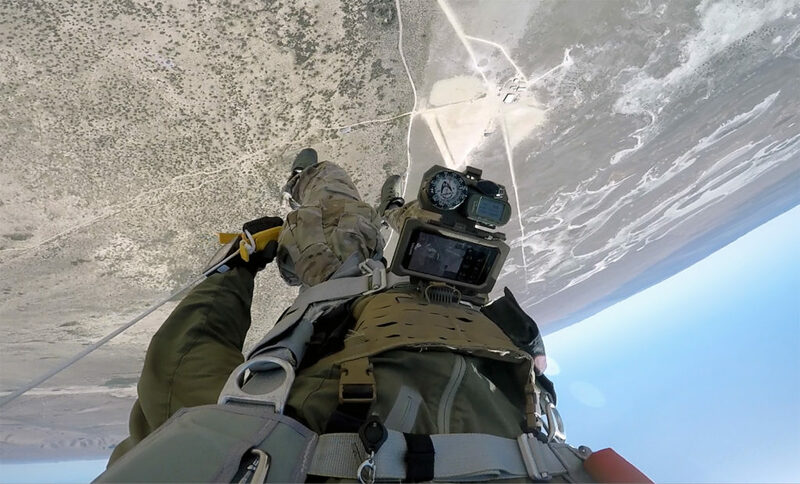 Six weeks later the first production parts were delivered to several drop zones for testing and feedback. The feedback has been hugely positive, the result of carefully observing, listening and iterating. This real-time, collaborative product design process has proven instrumental in helping clients resolve challenges and implement solutions quickly. JUGGERNAUT DESIGN is an authority in rugged design, bringing innovation and expertise to products that must survive challenging environments across commercial and defense applications. Under canopy and display providing full navigation to the LZ (landing zone). The jump board is stowed securely again before landing for safety.